It was May 1. West Ottawa Sr. Drew Pederson stared at his computer screen late at night. He wasn’t watching Netflix or refreshing Twitter; he was attempting to decide where he will attend school for the next four years. At the end of the night, he had to decide to either play basketball at Hope College or give up the sport he has dedicated so much of his life to in order to attend his dream academic school: the University of Michigan. After talking with friends, parents, and coaches, he had finally made his decision. Pederson opened the University of Michigan website and accepted his admissions offer. Months of stress and worry had come to a close, and his decision was final. Every high school senior becomes stressed about where to attend school, but recruited athletes have even more to consider. With the exception of the few Division I recruits, many student-athletes have to choose between continuing to compete at a small school or attending a larger school at the cost of pursuing college athletics. Student-athletes have decided to go both ways, and luckily, a vast majority are happy with their final choice. Pederson applied to 11 schools, some small where he could play basketball and some big where he would not be on the varsity team. After a lot of contemplation, he decided to forego playing on the basketball team at Hope College and pursue his education at the University of Michigan. Pederson is ultimately happy with his decision, and he still finds ways to play basketball. He made the club team, participates in intramural sports, and plays pick up basketball many nights of the week. “I still play quite a bit; I just do not have structured practices and games every day,” Pederson said. Pederson is just one example in this scenario. There are also many people who have forgone going to a larger school and decided to play sports at a smaller school instead. WO alum Caleb McNitt made a difficult decision similar to Pederson, but he decided to go the smaller school route with the ability to play football at Hillsdale College. McNitt felt that he could not give up football quite yet. “I just felt like if I passed on the opportunity to keep playing, I would always regret it,” McNitt said. He ended up enjoying more than just the opportunity to play football. “It seemed like the professors were there to help students learn instead of just lecturing,” McNitt said. Despite giving up his dream of attending the University of Michigan, McNitt thoroughly enjoyed his time at Hillsdale. He felt that he received an incredible education and was able to play his sport well simultaneously. “Joining the team was like joining a family, and I made countless friendships that will last a lifetime,” McNitt said. Logan Reimink, another 2018 grad, agreed with Pohl but decided to stick closer to home at Ferris State University. He runs cross country on Ferris’s team. Reimink wanted to run cross country for many reasons, but specifically cited that he enjoyed having a structured activity to do in his free time. He too is happy with his decision. “I have made great friends from doing cross country and wouldn’t have traded this experience for anything,” Reimink said. Had Reimink not gone to Ferris, he would have gone to GRCC and then transferred to Michigan State or GVSU. 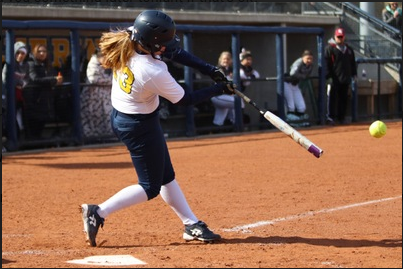 Kaylie McConnell, University of Michigan – Dearborn softball player, has found the best of both worlds at her school. McConnell has always dreamed of being a Michigan Wolverine. When she went to a softball camp over the summer at the Dearborn campus, she realized that might be the best route for her. “I thought it couldn’t get better; I could get a Michigan degree and continue to play a sport I love as an added bonus,” McConnell said. She finds that she still has the University of Michigan experience that she loves, but she is also able to play her sport. McConnell, like others, is truly enjoying her college experience. The decision may seem impossible, but recent history says that WO athletes will make the right choices for themselves.